About a year ago, I decided to make a hall table for my foyer. So, here I am, deciding to take the plunge into woodworking with only a cheap Ryobi portable table saw, some basic electric tools like a drill and circular saw, and not a whole lot of anything else. So, not being entirely sure I wanted to commit much money to this new found hobby, I decided to get some hand planes at the local antique store/flea market, and rehab them. I decided that would be cheaper then buying a jointer…which I eventually did, but I wanted to learn some basics with hand tools, and it was a cheaper way to get in on the ground floor. Hence, I now own Stanley #5 and #7 planes. After tuning these up a bit, I had some walnut I was going to flatten and joint to glue up a tabletop. I went to clamp this wood to the table I had basically screwed together out of some 2 x 4’s and some cheap sheet goods, and quickly realized a workpiece wiggling around because your table wiggles around is not a good thing. At that moment, the reason everyone has these big, thick, heavy benches on which to work wood became very clear. It is so that nothing moves, and no energy is wasted. As I started to look at workbenches, I also quickly realized that 2 inch thick maple or birch bench tops were not in my future, nor in my budget. I needed a bench that would work for me, but basically, it had to be cheap. That is when I discovered Bob and Dave’s Good, Fast, and Cheap Workbench. 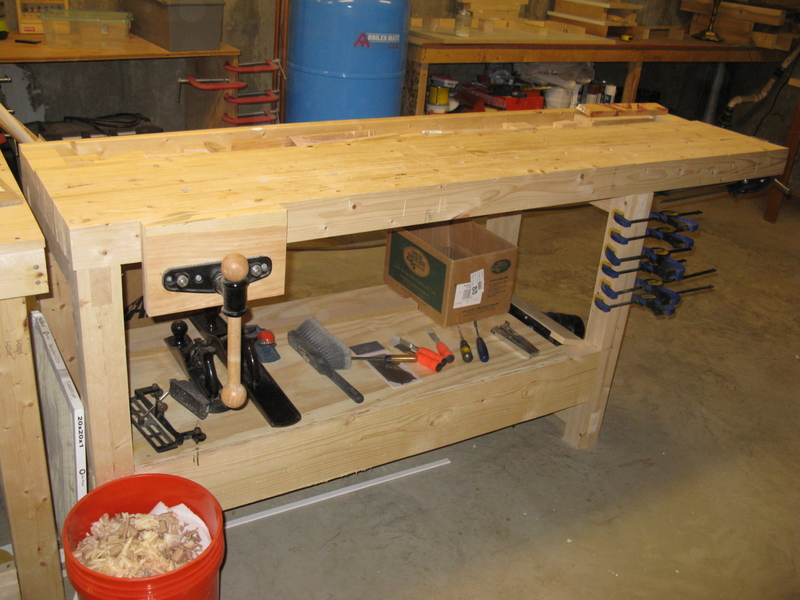 The link will take you to step by step approaches to make a workbench out of basic lumber stock you can get at any big box home improvement store. I did order the vises from Rockler, and have been very happy with them thus far. 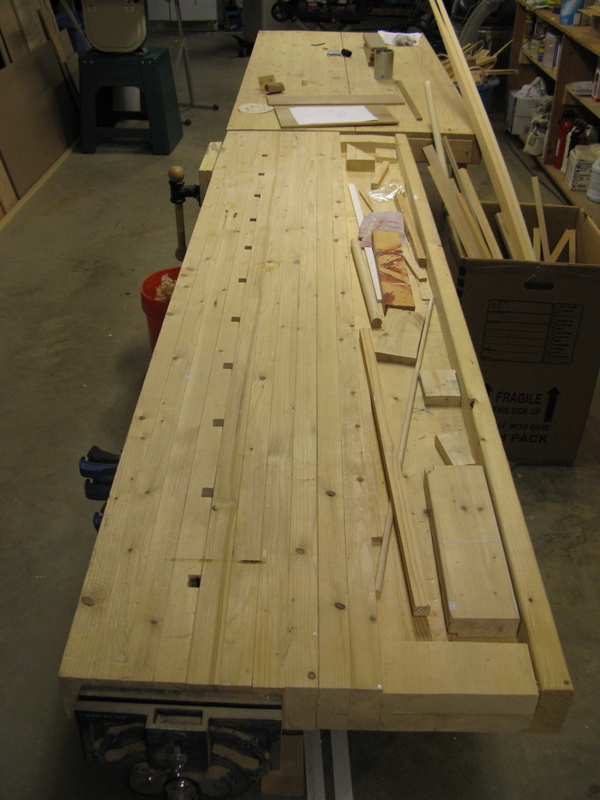 I put a piece of plywood across the stretchers to make a shelf, but otherwise the bench is as they outlined it. I did use my electric drill to hog out the mortises, finishing the cuts with chisels. I also used a circular saw for the shoulder cuts on the tenons and to cut the tabletop to length. I have to say I love it. It is rock solid, and works like a champ. I also was able to adjust it for my height, which makes it much more comfortable for me to work on projects. Sure it is pine and a soft wood that dents easily, but I also really don’t care about damaging it,. It was cheap enough, I know I can replace it easily, and I just flatten the surface again with my planes when it gets too rough. I am sure that someday, I will build that “perfect” bench, but right now, I am very happy with my ugly bench.